Having covered the park basics in the last blog entry, let’s take look at the icing on the cake…the park activities and events. Yes, between the Railroad and the State Park, it is difficult to find a weekend that doesn’t have a little something extra going on. So, let’s look at what’s in store for the summer. Opening Day, May 1st: Join us for refreshments and be the first to see the new things at the Interpretive Center. Join us as we open the park and see what’s in store for the new season. 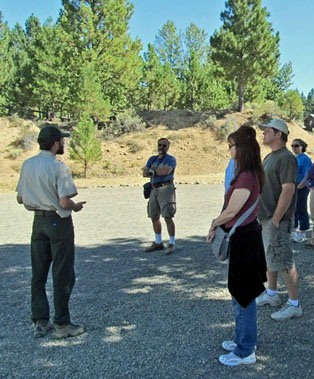 May 1st marks the opening of the park and the beginning Dredge tours on the weekends! Memorial Day Weekend, May 25th -28th: The first BIG weekend of the summer season in the whole of Sumpter Valley. Coinciding with the City of Sumpter Flea Market, this weekend also marks the beginning season of the Sumpter Valley Railroad. A great weekend full of fun! Train Robberies, June 2nd, 3rd, 16th, 17th: The Gold Rush Bandits ride again this summer! 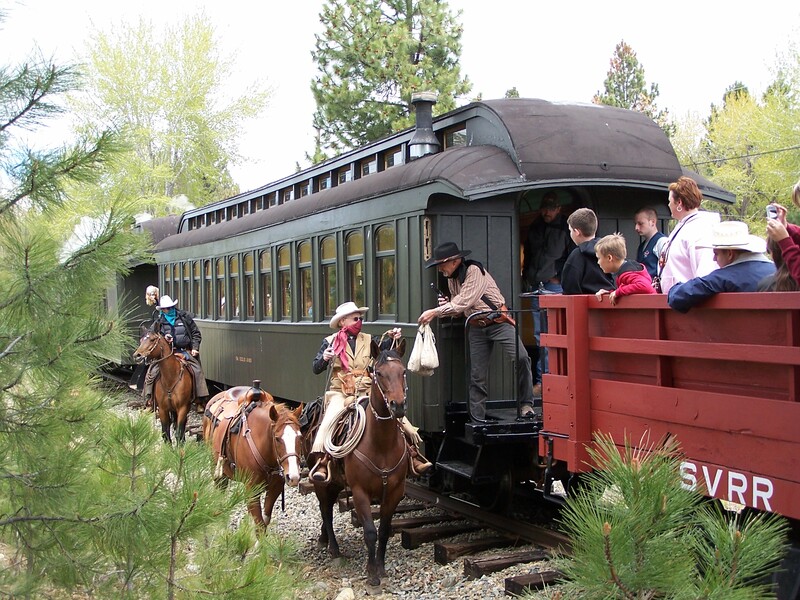 Come experience a real old-fashioned train robbery when you ride in on the Sumpter Valley Railroad, or watch from the Parking lot at the Sumpter Valley Dredge State Park. A lot of fun and a great photo-op. Fourth of July Weekend, June 29th, 30th, July 1st, 2nd: One of the few fourth of July weekends that starts in June! If you missed the Memorial Day Flea Market or want to have more Sumpter fun, we do it all over again in July! Fourth of July Train, July 4th: Is it difficult to come over on a weekend to ride the train or get a dredge tour? Then come over on Wednesday, July 4th when we’ll be doing BOTH…and on a Week day! Train Robberies, July 7th and 8th: More train robberies! Someone needs to catch those Bandits! In the mean time, if you missed the fun in June you have another chance in July, or ride again and bring your friends! 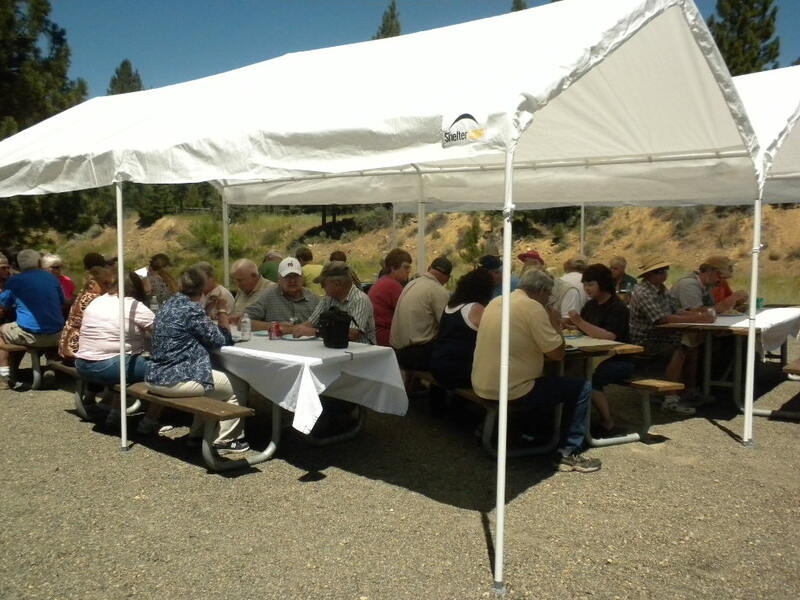 Sumpter Valley Dredge Heritage Day, July 21st: Come join the friends of the dredge for food, stories and fun. The Dredge Heritage Day is in honor of the men who worked on the Sumpter Valley Dredge, their families, and the people who grew up and now live in our little town. Hear stories of how it was, how it is, and of course..there is always good food. All are invited! MORE Train Robberies, August 4th and 5th: You would think someone would catch them by now, but they keep coming back! And you can too! Starlight Express, August 8th: Experience a beautiful summer night in the Sumpter Valley by taking a train ride. Beginning at 8:00pm in the waning light and ending in the starlight this is a great chance to check out the beginning of the Perseids Meteor Showers. Train Robberies, August 18th and 19th: Yes, there is more! Labor Day Weekend, August 31, September 1st, 2nd, 3rd: The last big weekend of the Summer Season. Come wrap up your summer vacation with a bang with the Flea Market, Dredge Tours, Train Rides, and Gold Panning. Train Robberies, September 8th, 9th, 29th, and 30th: They are relentless, those Bandits, but it means that if you missed it this summer or wanted to bring a friend, you get another opportunity! 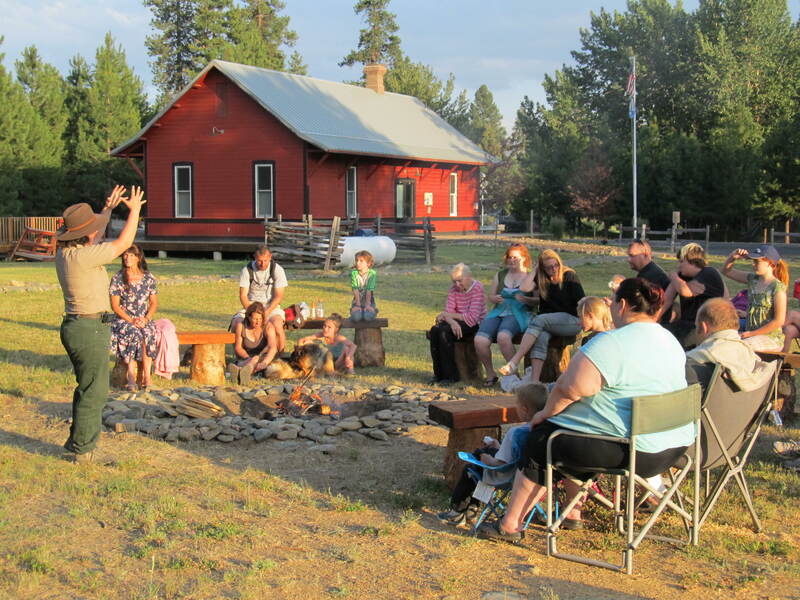 Another event to keep your schedule open for will be the Sumpter Valley Dredge Campfire programs. Dates still to be determined but a lot of fun for everyone. Please before to check into the following websites for updates and changes before planning your trips. Stay tuned for the next addition to this blog series where we look at what there is to do outside of the park. This entry was posted in Camp Fire, City of Sumpter, Dredge Tours, Gold Panning Lessons, Sumpter Valley Railway, Train Robberies and tagged Campfire Program, Dredge Heritage Days, Dredge Workers' Reunion, Gold Rush Bandits, Starlight Express, Sumpter Flea Market, Sumpter Valley Railroad. Bookmark the permalink. I think that could be a possibility. I’ve heard rumors that he liked being here so much that he plans to come through again this summer too!